Quezon island teeming with people frolicking on the beach. The island is only one of the three islands with facilities like decks, toilets and picnic sheds. The other two are Governor's Island and Children's Island with bathrooms, camping and sleeping areas. 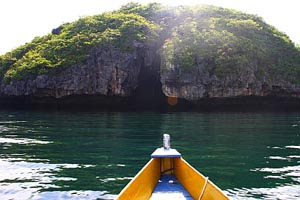 A view from inside the cave of Cuenco (PADI) Island. Also a nice camping site. It's also in Hundred Islands and nearby Bolinao where giant clams (Tridacna gigas) can be found. For details on accommodations, rates including resorts and rooms for backpacking and budget travelers, click here. Information on snorkeling, diving and other water-sports equipment rental and telephone numbers. Not much information on cheap resorts though. Commute: Victory Liner in Cubao and Pasay has buses going to Alaminos City. Trip is about 5 hours. 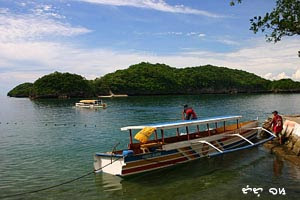 In Alaminos, hire a tricycle to take you to Lucap pier where you'll hire boats for the island-hopping trip. I saw photos of this place recently, didn't see the lighthouse, though. Looks like a unique corner of the world! my friends and i hung out at quezon island on good friday two years ago. sobrang dami ng tao. i think it's always best to go to the beach on the off peak season. wow buti ka pa nkapunta ka na sa islands sir..d bale nakasama na din ako sa mga litrato mo.salamat sa byahe sir. 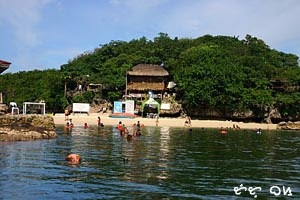 i [heart] hundred island, although meron din daw area jan na nag-a-undertow. gosh, pano ba mag-link dito? Ay naku, eto na nga - ipinost mo na ang Pangasinan adventure mo. hehe. It is sad - but I personally am not proud of our tourism management in Pangasinan. Needs a lot of improvement, don't you think? pieterbie, the lighthouse is quite far from the islands so it would be another trip for me. I need to escape to a beach right now. But anyway, the photos are good enough to be my imagery beach right now! I've a friend who hailed from Dagupan but is staying in the US now. you should get some freebies from the phils gov't for promoting our well/less travelled tourist spots. I love that photo from the cave! What a lovely travel report and with great pics - as always. You know I've never been there but seeing it through your eyes is very exotic to a Norwegian. Nice to know you have heard of our national writer too - have you red something of him? 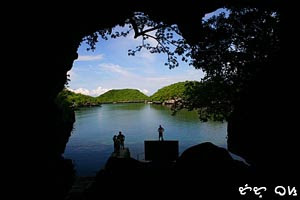 Hundred Islands is a great destination especially for those who love water and the beach. 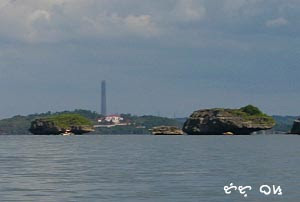 I wonder if there are interesting places near the Hundred Islands to visit so the trip to this area is sulit. rennyBA, learn by virtual visitng. hope to visit your part of the world too. I've read about Henrik Ibsen in high school books and some synopsis of his work. abaniko, not much time available but there are many interesting places in Dagupan to be explored. as rhoda said, government is not doing enough to promote and attract tourists. I want to try the longanisa. I've never had it. tnx 4 sharin these beautiful fotos of your adventure to Hundred Islands....me and my family (we have 3 kids) are planning to go there, and maybe stay for 3days....will appreciate it very much if you could give us pointers so we will get the most of our summer escapade budgetwise, and is there a guarded parking while we stay in the islands? The next time you are in the Hundred Islands please come by to say hi. We would like to Parasail you over the Hundred Ilsands 600 feet above the ocean. The airial view of the islands is great! We are Adventure Oceansports Hundred Islands the only full service ocean sports in the area please visit our web site www.hundredislandsoceansports.com please come visit us. We are also opening in San Fernando La Union in October for Big Games Fishing Parasailing and Extreme Banana Boat rides. hi, how long is the travel time from dagupan to hundred islands? wow how nice naman...how long is the travel time from baguio to hundred islands? we are planning to get there on december. 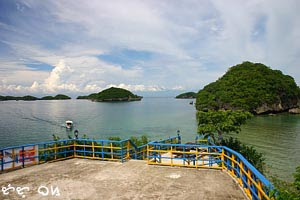 where is the best place to stay overnight in Hundred Islands? my family is planning to go there this coming April and i dont have any idea where we will stay. Please give me suggestions. Thanks and more power! pano ba ng parking sa hundred island? safe ba? victoria, you park your cars at resorts or at the marina, there are guards there. just don't leave anything valuable visible inside your vehicles that can attract bukas kotse gangs as in most places. hi tutubi, do you know any resort in la union where we can have banana boat and parasailing rides? may i know their contact numbers and names or contact persons? how about jim - one who posted something about parasailing (hundredislandsoceansports.com) by the way, tried visiting that site but cannot get through., do you have his contact number? he said that they will open in la union. kudos for your site/blog. everytime i go online and search for my next destination, i always come to a point to read your pointers. thanks. anyway, thanks for informing me. 'til next time. bakit po hindi kasama ang marinduque dito? 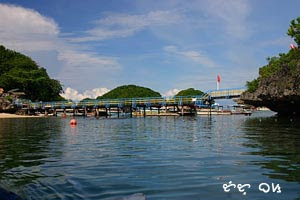 do you recommend to go to hundred islands this december??? thanks! how much po hire ng boats for the island-hopping trip per person sa hundred islands?